Galaxy Forum Kansas 2018 had ~75 participants in attendance to discuss various topics with theme “Eyes on Juno, Jupiter and the Sun”. Galaxy Forum Kansas is a collaboration between Space Age Publishing Company, the Ad Astra Kansas Foundation and International Lunar Observatory Association. Ad Astra Kansas is an information resource focusing on high-tech and space research, as well as an affiliate of the Kansas Space Grant Consortium since 2003. It was founded in 2001 with the Mission of Advancing the Kansas State Motto for the benefit of Kansas, America and the World. “Lord of the Rings–the Cassini Mission to Saturn” will be given by Todd Barber. Barber has been NASA-JPL’s lead propulsion engineer on the Cassini mission since 2002. Cassini has orbited Saturn for 13 years. In its aptly named “Grand Finale” Cassini swoops between Saturn and its innermost ring ending in the probe’s crash into Saturn on September 15, 2107. What has Cassini revealed over the years? What kind of close-ups, what kind of details, what do we hope to learn from this final mission? Barber is a Wichita native and Southeast High School grad. “The 2017 Total Solar Eclipse: What, When, Where, Why?” As a primer on this unique event, Dean Stramel, professor of chemistry at Fort Hays State University, will look into why this is such a big deal that people travel all over the globe to see it. What is the science behind it? What are the logistics to watching it? This will be information that can be put to use immediately on Monday morning–eclipse day. “Mars: Through the Eyes (and Lasers) of Curiosity” will be given by Sarah Lamm. A Kansas State senior, she has spent two summers at Los Alamos National Laboratory in New Mexico working with data from Curiosity’s ChemCam instrument (it’s the part that looks like the head and eye of Curiosity.) Her team’s studies about the presence of manganese, an indicator of the presence of liquid water, has important implications for the habitability of Mars. She will share these and other findings and what they mean. Sarah, a Colby native, is a great illustration of what young Kansans are doing in the space sciences. The Kepler Space Telescope’s discovery this spring of 1284 more exoplanets exploded the tally of its finds since its launching in 2009 to over 2000. Sharing with us her expertise and that of her colleagues on this bonanza of scientific discovery at the upcoming Galaxy Forum will be Kansas native Dr. Penny Warren. Warren has worked on Kepler as a Principle Engineer for Ball Aerospace & Technologies, Corp., the Colorado aerospace company that built the Kepler instrument and spacecraft for NASA. 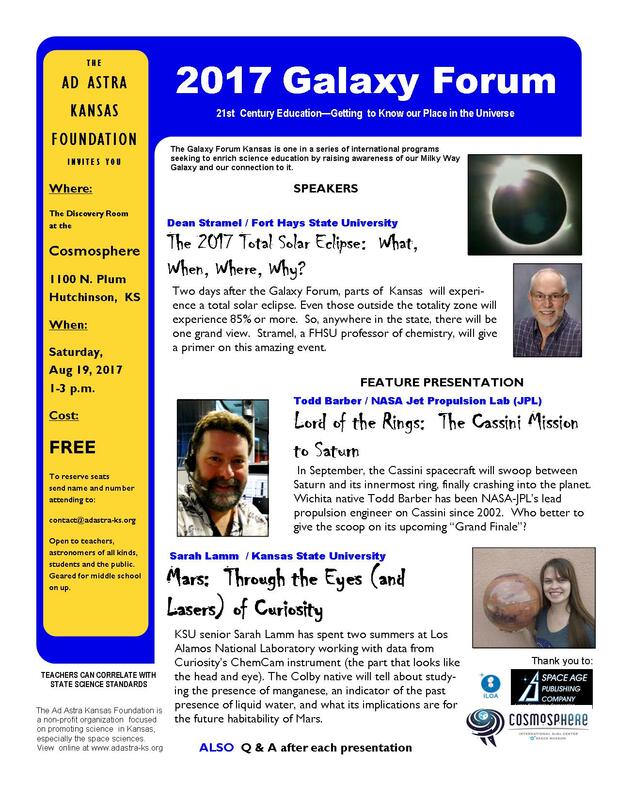 The Ad Astra Kansas Galaxy Forum will be held August 13 at the Kansas Cosmosphere and Space Center, Hutchinson, from 1-3 p.m. Also on the line-up is a presentation by the Kansas Astronomical Observers about the highly anticipated reopening of the Lake Afton Observatory near Wichita. Additional speakers TBA soon. This educational event is free, geared towards teachers, students and the interested public. Warren is currently the Area Manager for Ball’s Detector Engineering group, which de-signed, built, and tested the focal plane array in the Kepler photometer. She also is a technical contributor for Ball’s electro-optical instruments. A Winfield native, Warren earned a B.S. degree from K-State in physics in 1987, and additional MS and PH.D degrees Purdue University. She joined Ball in 2002. Kepler: A Search for Habitable Planets — Penny Warren, Ball Aerospace & Technologies, Corp. The theme of Galaxy Forum Kansas this year is “The Moon, Mars and Journeying to the Stars.” This is the 5th straight Galaxy Forum in Hutchinson, a program that has engaged hundreds of local teachers and accelerated the development of the Ad Astra Kansas Foundation. 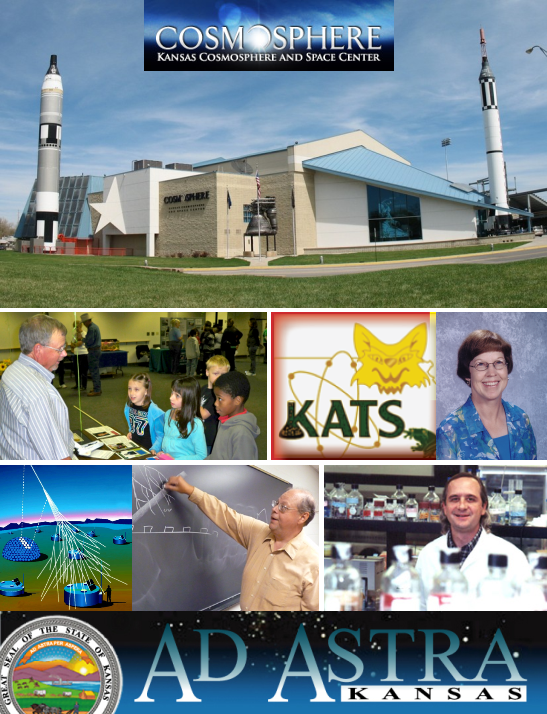 Founded in 2001 and an affiliate of the Kansas Space Grant Consortium since 2003, AAK Foundation is an information resource focusing on high-tech and space research in the state of Kansas with a mission to advance the Kansas State Motto, “Ad Astra Per Aspera” for the benefit of Kansas, America and the World. Galaxy Forum Kansas is co-sponsored by the Ad Astra Kansas Foundation, Space Age Publishing Company and the International Lunar Observatory Association. Founded in 2001 and an affiliate of the Kansas Space Grant Consortium since 2003, Ad Astra Kansas is an information resource focusing on high-tech and space research in the state of Kansas. The foundations primary mission is to Advancing the Kansas State Motto, Ad Astra Per Aspera, for the benefit of Kansas, America and the World. This event is free and open to the public. Seating Limited, please RSVP to jeanettesteinert@att.net. Intro to the Ad Astra Kansas Foundation — sponsor of today’s event— its mission and future projects. VOYAGER (Are We There Yet?) — We might be–according to Dr. Thomas Armstrong, NASA co-investigator on the Voyager project for its entire 35 years. In this update to last year’s presentation, find out from Armstrong the latest information which leads many scientists to think Voyager I has entered interstellar space and what they are finding out. EXPLORING SPACE WEATHER—The Van Allen Storm Probes Everyone is familiar with changes in the Earth’s weather, but weather also occurs in space. Changes in the Sun’s energy flow cause changes in the space environment near Earth. Twin probes launched last August are recording data to quantify the processes that generate the radiation belts and cause them to change. Learn how this affects our space-based and ground-based technologies. Learn what scientists are looking to find out from veteran NASA scientists Dr. Thomas Armstrong and/or Dr. Jerry Manweiller. FROM UNDERSTANDING BASIC PARTICLE PHYSICS —to exploring the Universe During the first half of 2013, a number of startling advances in astro-particle physics have been announced. In addition to this–the next ultra large cosmic ray experiment is being developed, regions of the world (including southwest Kansas) tested for their suitability to host such an experiment. In this talk you will get a brief introduction of the ideas of particle physics and how they are being transformed into astro-particle measurements to further understand the Universe and the forces within it. *Professional Development credit is available. Galaxy Forum Kansas is organized by the Ad Astra Kansas Foundation in collaboration with Space Age Publishing Company and the ILOA. AAKF is a non-profit organization focused on promoting science in Kansas, especially the space sciences. The Foundation and its members act as an information resource focusing on high-tech and space research in the state of Kansas and is an affiliate of the Kansas Space Grant Consortium. The Kansas state motto established in 1861, Ad Astra Per Aspera (To The Stars Through Difficulties), has been a source of strength and guidance for almost 150 years and continues to inspire 21st Century Education and scientific achievement. FREE and Open to Teachers, Astronomers of all kinds, Students and the Public. SPACE is LIMITED. To reserve seats send name and number attending to: info@adastra-ks.org. Teachers can correlate with State Science Standards. Later in the evening, 1000+ people attended the 3rd Annual “Starry Night” Observation Party which includes rocketry, education, music and star observations. This event is free, open to the public and is from 5:30-10:30pm. We appreciate new innovative ideas and renewed commitments to expanding and improving Galaxy education and exploration at all levels during Galaxy Forum Kansas 2011. Download the Galaxy Forum Kansas 2010 announcement here (337 kb PDF). The event continued with a spirited panel discussion on advancing and enhancing general science education in Kansas. Galaxy Forum Kansas also featured an “Additional Stellar Event” featuring an Astronaut presentation at the Cosmosphere marking the 25th anniversary of the maiden launch of Space Shuttle Discovery. Click here to download the Galaxy Forum Kansas program handout.